The unique design of our Modern Classic Lounge Chairs will dress up your waiting room! A popular choice for salon or beauty bar customer reception areas. Features unique chrome framework and legs and low back design. 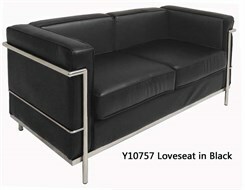 Modern Classic Leather Loveseat sold above. 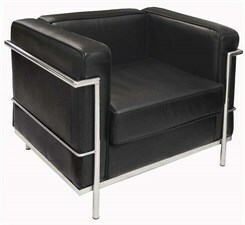 See Club Chair sold below. 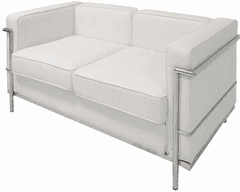 Modern Classic Leather Loveseat measures 59"W x 29"D x 26-1/2"H overall. Seating area is 46-1/2" x 22-1/2"D. Seat height is 17"H. Shipping weight 102 lbs. Ships fully assembled! PRICE INCLUDES SHIPPING! (Truck shipment - see Terms & Conditions). IN STOCK! 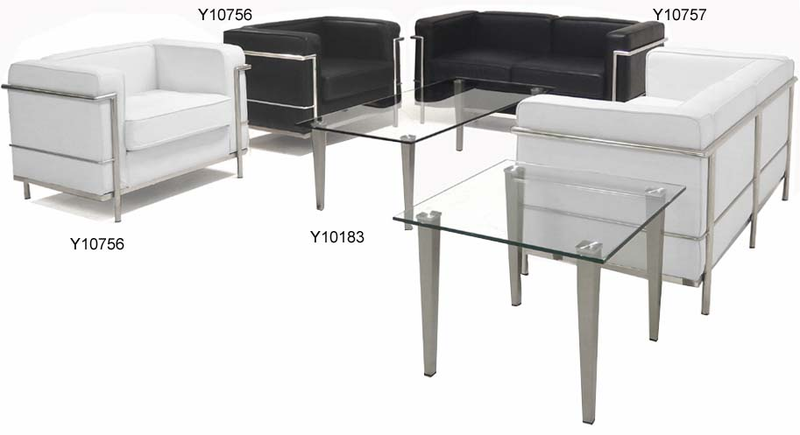 * All seated surfaces upholstered in your choice of Black or White bonded leather. 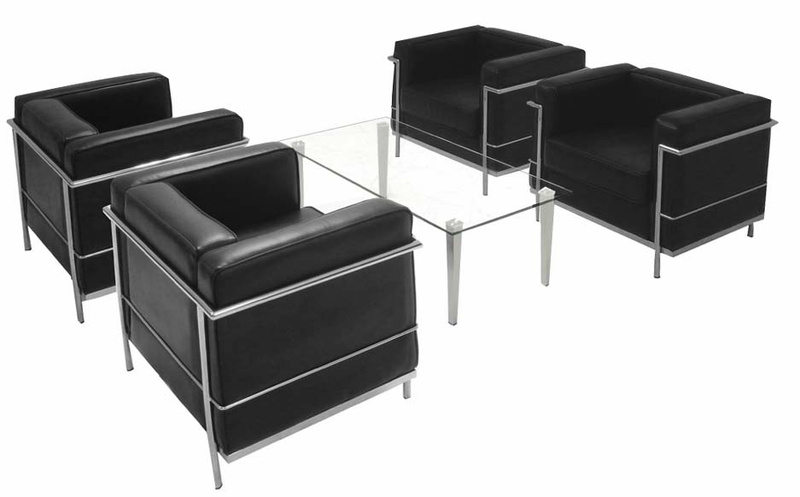 * Eye catching chrome finish over strong steel channel frames offer both strength and style for your busy reception area. * Protective black caps on feet for hard floors. * Choose from 2-seat loveseats or club chairs. * All components exceed ANSI/BIFMA commercial use requirements. Rated for users up to 250 lbs. * Loveseat and Club Chair ship fully assembled! 1 - 3 $499.00 ea. 4 - 9 $469.00 ea. Choose from Black or White leather. Club Chair ships completely assembled! Measures 35-1/2"W x 29"D x 26-1/2"H overall. Seating area measures 22-3/4"W x 22-1/2"D. Seat height is 17"H. Shipping weight 70 lbs. All components exceed ANSI/BIFMA commercial use requirements. Meets CA fire foam approval. 5-Year Limited Warranty. PRICE INCLUDES SHIPPING! (Truck shipment - see Terms & Conditions). IN STOCK! 1 - 2 $329.00 ea. 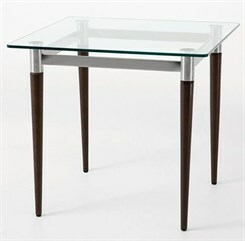 End Table features tempered clear glass table top with tapered legs. Legs available in brushed steel finish (shown) or wood in your choice of 6 finishes. Measures 22"W x 22"D x 20"H overall. Ships unassembled. Shipping weight 26 lbs. PRICE INCLUDES SHIPPING! Please allow 2 weeks for delivery. Coffee Table features Features a clear glass table top with tapered legs in your choice of metal or wood. Measures 40"W x 20"D x 16"H overall. Ships unassembled. Shipping weight 37 lbs. PRICE INCLUDES SHIPPING! Please allow 2 weeks for delivery.